Download our new white paper, 7 Habits of Highly Successful Users, or read it below! Marketing is a unique field that spans the spectrum of art and science. The most successful marketers employ a mix of creativity and data to reach their goals. But effective marketing can be an uphill climb, even for the most experienced marketers. The truth is, there’s not just one secret to creating an amazing marketing strategy. The best approaches are multifaceted, and include exciting and engaging campaigns, active social profiles, excellent customer rapport, and smart advertising. That’s a lot to accomplish by one person or even one small team. Here at ShortStack, we pay close attention to what our most successful users have done when their Campaigns bring the results they’re after. We’ve found that the best Campaigns include a handful of “must-dos,” and in today’s post we’re sharing results from a new study that includes analysis of thousands of successful Campaigns. ShortStack (ShortStack.com) is a marketing campaign-building tool used by small and enterprise-level businesses, and by large agencies. Founded in 2011, ShortStack is a software as a service (SaaS) platform, and also offers custom design services. ShortStack was recently named an Inc. 500 company. ShortStack was one of the first companies to see potential in Facebook as a place to host tabs (which Facebook also refers to as “apps”), contests and landing pages. Since 2011, ShortStack has expanded its features and services to be a one-stop-shop for marketers and social media managers who need a multipurpose social media hub. With ShortStack’s Campaign Builder, contests and landing pages — which are all known as “Campaigns” — can be designed and then promoted from any social network, and can also be embedded on existing websites. The purpose of this study was to identify practices that help us identify our most successful users. Success was measured by Campaign engagement (views and entries). We evaluated the top 1,000 most successful ShortStack Campaigns, and from there, closely studied the top 100 users, meaning those with the most views and entries per month. Whether you use ShortStack or some other campaign-building tool, this list of best practices will help you market smarter. Our top users’ Campaigns receive an average of 3,200 entries per month — and an astounding 46,376 views per month. What this information tells us is that these users get great engagement on their Campaigns, so their efforts are working. Engagement equates to data; those entries are leads that have come to their brand directly, giving our top users the chance to turn those leads into loyal customers. This is a lot of valuable data these users are receiving on a regular basis. 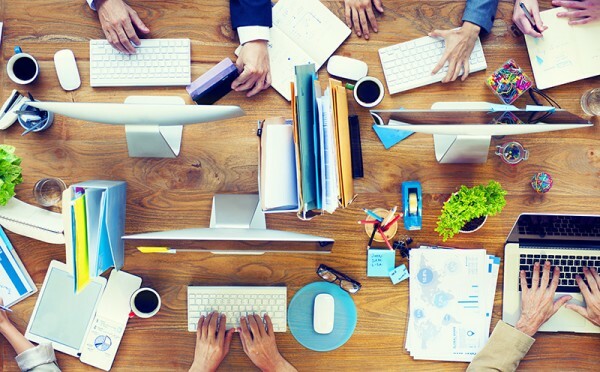 “ Use your resources” is a fitting adage in all walks of life, but for marketers, this is especially useful advice since the internet is filled with high-quality marketing content. Not every successful marketer has a marketing degree, and even if you do, it’s such an ever-changing field that it requires a lot of reading and studying to stay up-to-date. Our data showed that a third of our top users were referred to ShortStack from our blog, and often put the advice shared in our resources into practice. Accessing helpful resources means taking advantage of expertise from the people who have already figured out some solutions to problems you may also experience. This isn’t just a shameless plug for our blog (although we work hard to make it useful and interesting! ); it’s a reminder to scout out the resources that your favorite brands are creating just for you. Always look for a blog link on a brand’s homepage, and take up offers to download free white papers, ebooks, and worksheets. These are resources you can peruse at your leisure, but you’ll likely create a goldmine of a marketing archive over time that you can reference again and again. Great customer relationships don’t happen overnight. They’re the result of careful and consistent outreach and rapport. This requires planning and patience. On average, our top brands spend about 18 months running Campaigns consistently to engage with their audience, and the persistence pays off. Start by identifying your “dream client.” Visualize who you want to be using your service or your product, and create your Campaigns around that. Be active participants in the communities where your dream clients are found (but don’t use that insider knowledge to spam these users). Consider it field research, and create actionable steps after scouting out your dream clients and learning about their interests and habits. This also shows these potential clients that you do understand them and their needs. On average, our top users have 42 Campaigns published simultaneously. This number even surprised us! When we looked at what types of Campaigns they are running at once, we saw a combination: “set-it-and-forget-it” Campaigns (like newsletter sign-up forms or informative landing pages); limited-time contests and giveaways; feeds for blogs; and social media hubs. One reason these users have so many Campaigns is because they are longtime users, which helps reiterate best practice #2 — spending time, energy and effort investing in a platform and a strategy can pay off. For instance, some of these users have been using ShortStack for four years; ten Campaigns per year for four years attributes to their prolific Campaign creation. This diversified approach shows that top users are thinking outside the box and are willing to go the distance for gathering leads and attracting new customers. Plus, the more ideas you try, the more you’ll be able to see what sticks with your ideal customers/users. Through past studies, we’ve found that users who run omnichannel Campaigns — meaning, posting a Campaign to more than one platform simultaneously — receive 83 percent more views than do Campaigns published just to Facebook. It’s easy to get comfortable running Campaigns for just one place (like Facebook). But the engagement on omnichannel Campaigns is much higher because you’re exposing your brand to more people. Although there may be some crossover, each network (Twitter, Facebook, LinkedIn, Pinterest and Instagram, for example) has a unique user base, so your followers will likely be different on each platform. 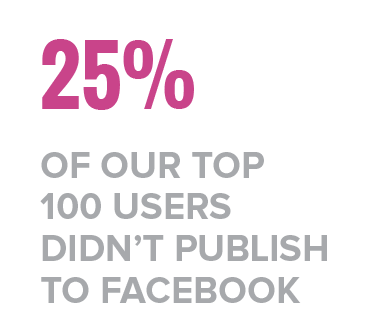 In our sample group of the top 100 users, 25 percent didn’t publish to Facebook at all. This doesn’t mean they don’t use Facebook at all; it just means that they saw value in running a Campaign other than just as a tab on their Page. They ran their Campaigns on other platforms, and also embedded their Campaign to their existing websites. Our top users published Campaigns to an average of two pages; this is telling, since the same users also have an average of 42 Campaigns published at any given time, and they’re finding value in publishing this array of Campaigns in multiple places. Many of the Campaigns our top users created involved the selection of a winner; in fact, our “Pick Random Entry” tool was used an average of 25 times by each top user per account lifetime. This meant that they were running contests or sweepstakes as part of their engagement strategy and selecting a winner. A contest with a prize incentive is excellent for engagement, and this doesn’t require having to giveaway something big or expensive. The prize should be relevant to your user base, and relevant to your product. For instance, a photographer can offer some free prints or a discount on a photo session, therefore attracting potential new customers or bringing existing users back to their service. Our top users stick with prizes within their industry to ensure that the leads they collect are legitimate and worth pursuing. The majority of our top users are subscribers to our Full Stack plan, which is our mid-level subscription that offers many premium features, such as white labeling and embedding. It’s tempting to stick to the free plans that many services offer, but investing in a subscription means that there is value in it for you. Consider how your Campaigns are coming across to your “dream clients” (from Best Practice #2). The more you’re able to customize your Campaign and tailor it to your brand, the more excited people will be to interact with it. Premium features also give you freedom to get creative with how and where you publish your Campaign. For instance, 41 percent of our top users embed their Campaigns to their website. By embedding, they are able to drive more traffic and engagement to their existing website, and the Campaign is completely white labeled, so it blends seamlessly into their existing branding. To round out our best practices, this final tip goes hand in hand with our #1 best practice, — “use available resources” — ask for help! No one is a perfect marketer, or ShortStack user, from the get-go. By asking our team questions about the platform, our most successful users are able to unlock all of the features and get the most from the platform. Our top users submitted an average of three tickets to our help desk per account lifetime. The questions weren’t always technical in nature, either. Top users tend to come to us for advice on what they should do next, or they send their Campaigns to us to review and ask us if there are missing elements or other changes we’d suggest. This allows us to directly aid in the success of the Campaign, as we can make suggestions to use some features in our platform that they may have missed. And it gives us the chance to see what our users are making and to think of ways we can help them reach their goals. It takes a team to make a company succeed, and we don’t believe that great marketing tips need to be kept secret. Ultimately, the main lesson here is that it takes time and creativity to succeed. Try multiple approaches to connecting with your dream clients, and think outside of your normal go-to platforms for publishing and sharing. Employing these best practices is a good start. They aren’t one-size-fits-all, but the data from our top users shows that these suggestions can be applied to a wide range of industries and brands. Over time, these tips might lead to some new specific practices you can implement with your team. As you see more success, they’ll likely become second nature, too.